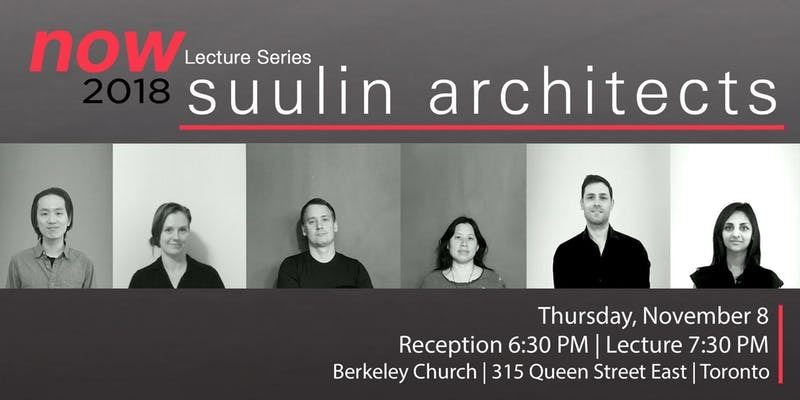 now 2018 Lecture Series: SUULIN ARCHITECTS inc.
Join us for a cocktail reception beginning at 6:30 PM, followed at 7:30 PM with the now lecture presented by SUULIN ARCHITECTS inc.
As both a celebration and a sharing of ideas and experiences, the OAA now lecture series recognizes the contribution by emerging firms to the profession and provides a setting to discuss the opportunities and challenges faced by young practices. The 2018 edition of the OAA now lecture series is presented by SUULIN ARCHITECTS inc., the recipient of this year’s Best Emerging Practice Award. SUULIN ARCHITECTS inc. is a six-person architecture firm located in downtown Toronto with an associate office in New York City. Amy Lin and James Chavel started their collaboration at Shim-Sutcliffe Architects in 2008, working as co-project architects on an assisted living home for the Sisters of St. Joseph in Toronto. After completion of the project, they established SUULIN ARCHITECTS inc. in 2014. Come hear the insights and knowledge that Ontario’s Best Emerging Architecture Practice has to share!